Looking for more time for you? 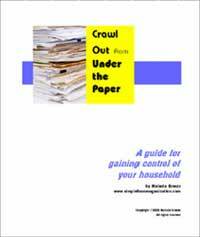 Overwhelmed with the amount of paper clutter in your home? Exhausted from running in circles to keep the house in order? Frustrated with finding the file you need on the computer? Step-by-step instructions on creating a filing system that will take care of ALL the paper in your home. No more wasting time digging around for that document you are looking for. Make the stack of paper on your counter a thing of the past. Print, cut, and use the file labels in the Appendix and your new hanging-folder file system will be ready to use in minutes. Meal planning/shopping tips. No more running around trying to figure out what is for dinner at the last minute. Learn how to take a few minutes per week to make mealtime more enjoyable. Time-saving lists that will make daunting tasks easier. How-to tips for organizing your computer files so you can easily back up your data and find files. Strategies to get the housework under control. Other organizational time-saving tips and ideas. Click here to see a list of the book’s chapters. With a few simple changes, your chaotic house will transform into an organized home you will want to relax in, not run from. How much is more time worth to you? ** Once you complete the transaction, click the “Return to Simple Home Organization” to be directed to the download page. An organized home will free up more time for fun and reduce your stress. I am a busy mom of three children who are in three different schools, and I own and operate two businesses from home. I’m also an avid volunteer for several organizations, so you can imagine the amount of paper that comes into my house on a daily basis. I wasn’t always organized. There was a time, years ago, that I joked about needing a 48-hour warning before anyone stepped foot into my home. Overwhelmed and exhausted, I knew there had to be a better way to handle the housecleaning, the cooking, and the organizing of a mound of paper. This book contains my real-life solutions to running a household efficiently. I know they work because I use them every day. I no longer have a pile of paper on my counter, and I know where every piece of paper is located if I need to find it. Feel free to email me at:with any comments or suggestions. I would love to hear from you. Simple Home Organization – helping busy people get organized – one tip at a time.